One complaint that I hear from people who don’t like a given project tracking tool is that there is actually too much information on the screen at once. They find it distracting and it makes it hard to find the really relevant information. In response, usually I nod my head sagely, mumble something obscure, and move on. But when I give my talk on the pros and cons of using physical vs. electronic project tracking tools I neglect to mention this difference. If I stop for a minute and take a good hard look at the task board our team is using right now, it doesn’t say a whole lot compared to the electronic tools we use. For one thing, the team and I keep a pretty sloppy task board. Stuff gets crossed out, notes are written in the margins, extra stickies are tacked on top of other stickies. We know what it all means, mostly, but I’m not sure that anyone else could easily parse it all out. There’s a lot written between the lines in both a literal and metaphorical sense. On the other hand if I use my electronic tools, they pretty much force me into a much more orderly state. 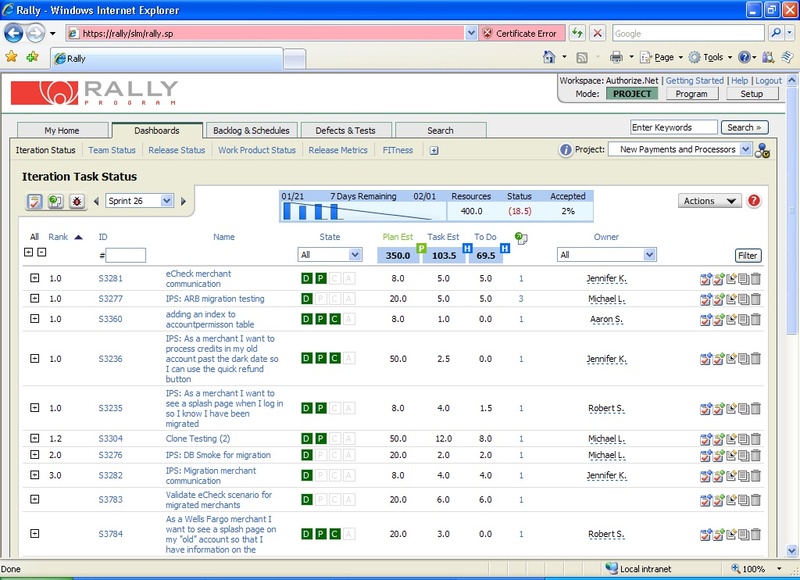 There is a lot of explicit information displayed – it takes a while to setup. But it’s neat and orderly. If I need to make notes, then I can put something in the “notes” field. Unfortunately the notes field is not normally displayed. I have to “open” a story to view the notes. Information is cleverly hidden. Like I said, it’s neat, it’s tidy, there is lots of information, but some parts are hidden. Hmmm…Of course there is hidden information in my physical task board too. I have a confession to make: As a team, we’re pretty lazy – and proud of it. We’re firm believers in helping our environment by practicing the conservation of syllables. Why use two words when one will do? Mike Cohn said it best, The user story is a placeholder for a conversation. Amen brother! It’s remarkable how much we can read into so few words! So both types of tools have their own forms of information density. And they both have different types of data that is “hidden”. Of course, I have more control over the physical taskboard than the electronic one. I’m pretty much forced to display certain data using electronic tools – even if it isn’t necessarily relevant to me. That’s probably where the information density argument comes in. I don’t mind information density if it is exactly the information that I want to see. However, if it’s not relevant to me, then it only serves as a visual impediment. Something to keep in mind the next time you are tool shopping. Check ’em out. Thanks to those who helped by pointing me toward these products – I appreciate it! You know, sometimes the hardest part of working with a team is learning to shut up. During the honeymoon phase of a project (forming), it’s easy to deal with the team with a reasonable sense of detachment. If they make a decision that you find questionable, it’s no big deal. When the team steps on that garden rake, Whammo! “Hey, I bet that really smarts!” You just shrug it off and move on. Maybe we should try CI? What if we documented the architecture first? How about we stick with the simple solution rather than the absurdly complex one? Perhaps we should commit to less work this sprint? The hard part is when you watch the team insist on performing the same failing maneuver for the 10th time. You’ve gently suggested that maybe they should watch out for that rake…and your words seem to fall on deaf ears! You beg, you plead, and here they go again! That’s when I’m most likely to completely lose it. My face turns red, I sprout horns, a tail, a forked tongue and I’m likely to “Lay down the law” We’re going to do it my way now – you boneheads! Somehow, the words are better received if I manage to keep my mouth shut and postpone my suggestions. I seem to get more value out of biting my tongue and keeping mum. Observing rather than proscribing. When I catch myself escalating toward a blowout – that’s when I need the most intense focus. It’s hard. There I am in the back of the room twitching like someone with Tourette’s syndrome. Talking to myself in the hallways. Arguing with my coffee mug. Banging my forehead on the filing cabinet. It ain’t pretty. I don’t always succeed at holding it all in. But, more often than not, the team is much more receptive if I have quietly observed and allowed them to have their own experiences. And so what if they think I’m weird? I’m tremendously excited to be given these opportunities to present at such a big event. If you’re attending, be sure to drop by and catch one of these presentations. 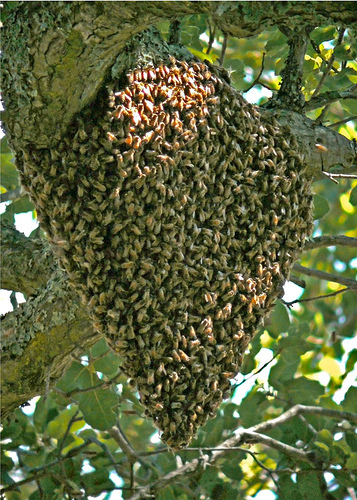 From the definition it is apparent that the idea of a swarm is perhaps most commonly used to describe animal behavior. In this particular case, swarming refers specifically to the behavior of insects, namely ants, bees or locusts. However if we look at the broader expanse of animal behavior we can find similar behaviors in many different species. For example birds exhibit flocking behavior and fish are described as traveling in schools or shoals. These behaviors, swarming, flocking, schooling are much more than just simple groupings of animals. When observing these groups, there emerge new complex behaviors that serve to benefit the survival of the group as a whole. These groups or throngs form highly complex systems of interaction that are very difficult, if not impossible to predict. For example, from observation of the simple behaviors of any one individual in the group it is impossible to predict the actions of the group as a whole. Therefore, from a micro perspective, the action of the group can appear very chaotic. However, from a larger perspective, the macro view, a cohesive pattern of behavior may emerge. The decisive moment didn’t take place in the main cluster of bees, but out at the boxes, where scouts were building up. As soon as the number of scouts visible near the entrance to a box reached about 15-a threshold confirmed by other experiments-the bees at that box sensed that a quorum had been reached, and they returned to the swarm with the news. So for the bees, a complex decision making strategy has evolved from the simple behaviors of members of the swarm. Observation of any single bee will not predict the outcome of the decision. It is only by observation of the group as a whole that the outcome can be foreseen. As a swarm, the bees are exhibiting a form of intelligence that is not present in any individual member of the group. This group is exhibiting complex adaptive behavior. The whole is greater than the sum of its parts. Separation: steer to avoid crowding local flockmates. Alignment: steer towards the average heading of local flockmates. From these three rules, we see very interesting behaviors in flocks emerge such as a flock that dynamically splits and re-joins to avoid obstacles. There are many of these sorts of models for flocks, swarms, and schools – all with different sets of simple rules that can be applied to the individuals in the group. It should be noted that in swarming theory there is the absence of central control. There is no manager bird that tells other birds how to fit in formation. These groups are self-organizing – obeying simple rules without any higher organizing authority present. So, if we can use the mathematics of complex adaptive systems and chaos to model the behavior of animals, can we create similar models for the group behavior of crowds of people? Here we enter the field of economics and game theory. We are attempting to create a predictive model for the behavior of groups of people (organizations or markets). In “The Wisdom of Crowds” Author James Surowiecki does just that: he applies simple rules of behavior to individuals in a group to help explain the complex behavior that evolves in crowds. Swarming theory has also found use in additional domains such as artificial intelligence and military applications. In AI, swarming theory is being used to manage swarms of tiny robots that collaborate to perform tasks (nanotechnology). In the military, swarming has relevance to both military tactics as well as for controlling the behavior of drones that are playing a larger and larger role on the modern battlefield. So we find the notion of swarming, which originally came from the animal behavior, is actually applicable to a much wider array of domains. In fact, swarming actually has a mathematical models to back it up. So it appears that Swarming has a solid foundation in theory and a broad range of applicability. The question is, how can we apply the principles of Swarming Theory to Agile teams? 1. Whoever comes are the right people. 2. Whatever happens is the only thing that could have. 3. Whenever it starts is the right time. 4. When it’s over, it’s over. These four principles are the only rules needed for an Open Space meeting. If you have an idea, you share it. If people are interested, they listen. If people are not interested, they move on. It enables a group to focus on talking about the most relevant issues for them, rather than being forced to sit through lectures from others that they may not be interested in. Using only these rules allows for unpredictable discussions to emerge. We don’t know in advance who will be talking. We don’t know in advance what topics will be the most interesting. All we do in an open space is create the conditions that allow those topics to emerge. The key to making swarming work is applying the right rules. I was facilitating a planning meeting with the team a week ago and it was not going well. We had our stories all ready to go before the meeting. The stories were well formed. All we had to do was come up with a list of tasks for each story. How long could that take? An hour? An hour later we finished the first of nine stories. It had taken us an entire hour to identify 3 tasks! It was like pulling teeth. I’d ask the team to provide a list of tasks…silence. I’d take different approaches, “how do we break the story down?” I’d suggest different kinds of tasks…silence. I swear to God I don’t beat my teams with a stick. But the silence was ominous. Why couldn’t they come up with even the simplest tasks? I racked my brain trying to figure out what I was doing wrong. Was I intimidating the team? Was someone else? Then it hit me. They didn’t know the architecture of the product! Of course they didn’t know what tasks they would need. They simply had no clue! I spent the next week working to make the architecture of the system visible to the team. Information radiators with diagrams of the static class design. Interaction diagrams, you name it. The next time we had a planning meeting, the tasks came quite naturally. 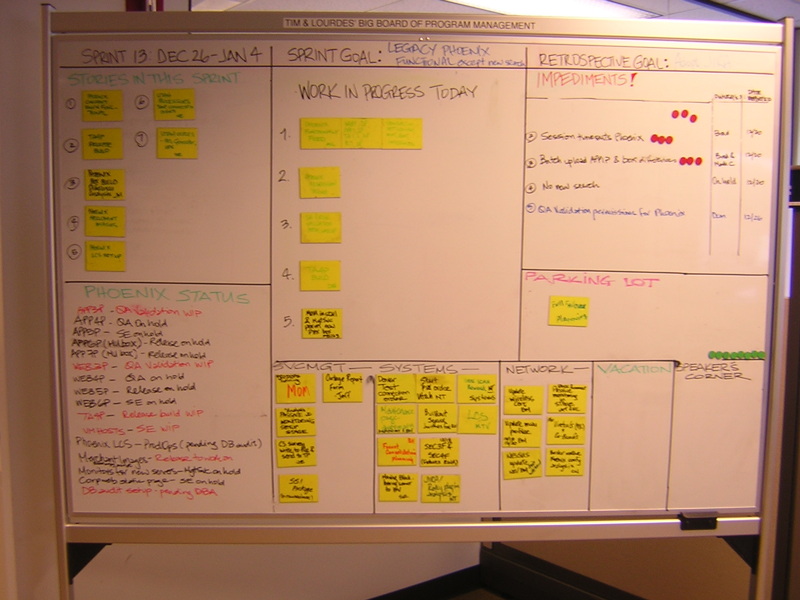 You are currently browsing the Agile Tools blog archives for May, 2008.